Add a Pop! token of the DC universe to your keys or bag! Key chains inspired by Batman: The Animated Series. Assortment includes Batman, Robin, Harley Quinn, The Joker, Catwoman, Clayface, and more! Display case contains 24 randomly selected, individually blind-bagged key chains. 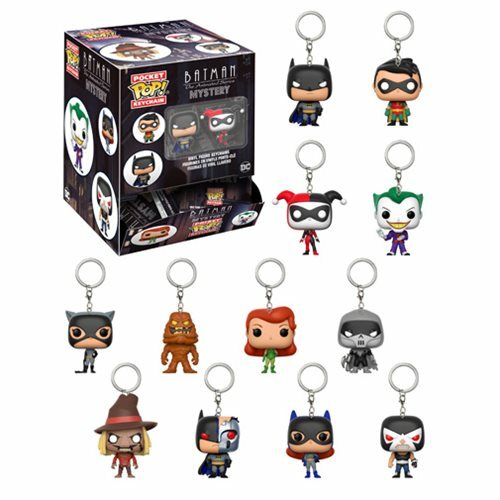 Add a delightful little token of the DC universe to your keys or bag! How? Just hunt and collect miniature Pop! versions of your favorite characters as key chains! Each figure measures approximately 1 1/2-inches tall and comes packaged in a blind bag. This awesome assortment inspired by Batman: The Animated Series includes Batman, Robin, Harley Quinn, The Joker, Catwoman, Clayface, Poison Ivy, Phantasm, Scarecrow, Robot Bat, Batgirl, and Bane! Which ones will you get? Ages 3 and up. This Batman: The Animated Series Pocket Pop! Key Chain Display Case contains 24 randomly selected, individually blind-bagged key chains.